Above: Frames from two different sections of Horizontal Boundaries. 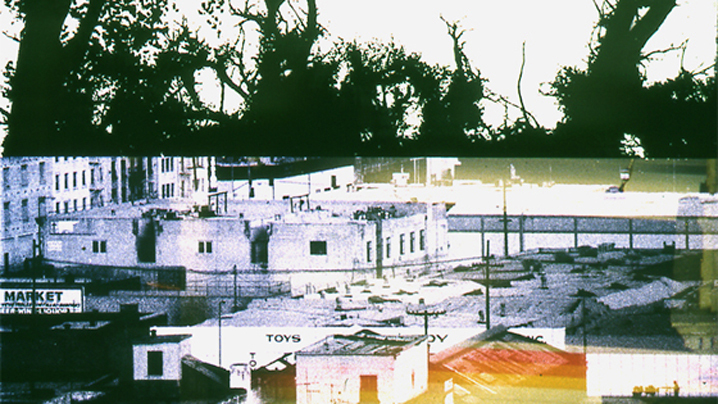 Horizontal Boundaries is Pat O’Neill’s two-dimensional follow-up to his terrific three-dimensional film The Decay of Fiction (2002), which had ghostly live action shimmer over footage of O’Neill’s camera moving through an abandoned and soon-to-be-demolished Hollywood hotel. The soundtrack of that film—music and dialog snipped from old noirs, as well as original writing—continues as connective tissue to Horizontal Boundaries, as does the Los Angeles setting, but O’Neill moves away from the 3-D space of the hotel and greatly expands his canvas by flattening images of the city—the beach, the palms, industrial complexes, endless suburban, Southern California-style houses—and overlaying them on each other in a rhythmically charged progression (one image will play in the background as several more, like slides, will momentarily play on the top of the screen, then move to the middle, then the bottom, all keep in regiment through similarly patterned, looped sound and music). 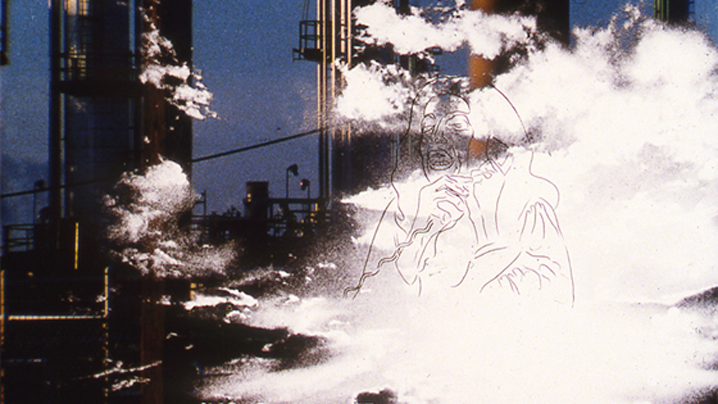 The film is divided up into a number of sections, too many to recount and each a miniature tour-de-force, but the scope of the work, which aesthetically seems to attack the thinness of Los Angeles’ memorable, or at least defining images, but gradually emerges as an intoxicating, cacophonous medley of simultaneous places, sounds, and dreams (one of the sub-sections seems a dream of the city of water everywhere, icy and cool, flowing water). A masterpiece of startling effect and ideas, Horizontal Boundaries is a tremendous achievement of conceptual expansion in both O’Neill’s cinema and in the already full to the point of bursting catalog of representations of the city of angels on film. 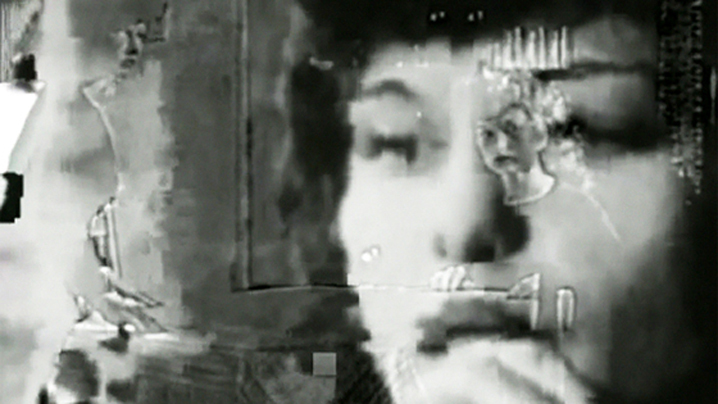 An interesting technological experiment—though as an theatrically exhibited video one might say gimmick—, Baron and Goodwin’s Loseless #2 takes Maya Deren’s seminal avant-garde film masterpiece Meshes of the Afternoon and downgrades it to the pixelized hell of video. But wait—this is not mere media transfer, Loseless #2’s pixels truly transform Deren’s work. Already a story of a dream, the video pixels interact with Deren’s film like a fourth-wall: at first they seem to attack the filmic detail, invading and corrupting Deren’s imagery, but soon they acquire a terrific re-invention of space and time. The pixel corruption surprisingly turns transitions between shots into an even more surreal event, as one shot freezes and another seems to emerge from behind it, the sequential-ness of film editing (this shot, then this shot, then this shot) replaced by a kind of layering effect, as if the entire screen were made of tiles or puzzle pieces, and as they fall away or re-arrange themselves a picture behind the picture, a movement behind the movement appears. Eventually, Goodwin explained the project: that he and Baron downloaded and played several partial torrent files of a digital copy of Deren’s film, letting the lack of completion of each file produce the errors and corruption that resulted in the haze of pixel distortion. Yet as random or stunt-like as this approach may be, the results are undeniably thrilling, the process creating a modern kind of dream language that combats and in the end terrifically coincides with the atmosphere of Deren’s remarkable piece of imagination. Despite the black and white still provided above, Jim Jennings’ Public Domain is done in startling, plastic color, as the filmmaker grabs snatches of imagery from below mid-town in Manhattan. Not having seen any work by the filmmaker before, it was difficult, in the montage flurry, to grasp at what I was supposed to be seeing beyond the rhythm and the color. 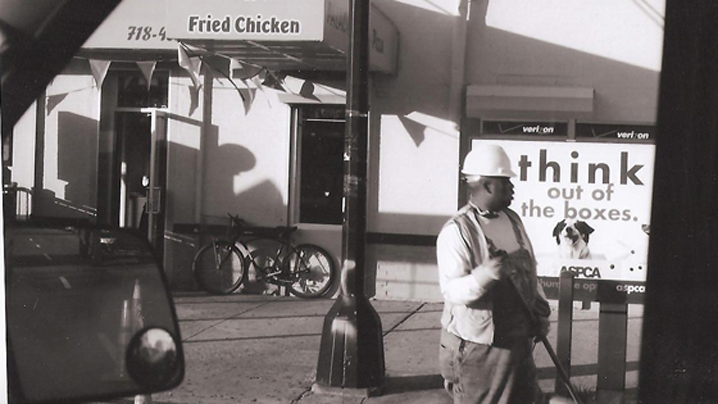 But soon, falling into the film’s incredibly brisk movement, I began to be thrilled by Jennings capturing the barest minimum of gestures and signs. Not a series of gestures, mind you, but seemingly the movements, the meaning, the text grasped at a split second in the dead center of its being, the beginning and end of each “thing” neatly, economically cut off, leaving at once a suggestion and something pure, centered, and instantaneous: the most whole of things caught for the briefest of moments, both so small and so fast it is nearly impossible to say what they were. Photographing dig arrows around jack hammering sites on his street, Robert Todd's Dig turns reportage into a furious graphic montage of imploding and exploding directions, arrows every which way. 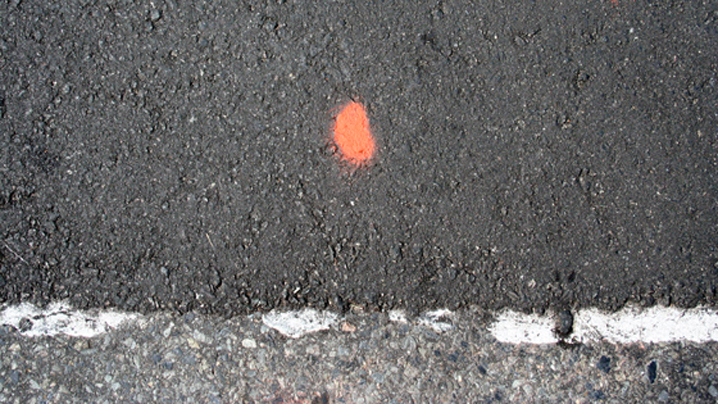 The rhythm, along with the hammering noise on the soundtrack, is very much akin to the aesthetic of targeting systems and of videogames of the 1980s , as if the animation of the still paintings were that of an attack or defense, making the fact these arrows in actuality precede drilling and hammering into Todd’s street all the more fitting. My favorite film in the Wavelengths 2 program, otherwise gone unmentioned here due to time constraints, might very well be John Latham’s Encyclopaedia Britannica, which starts with a cute idea—quickly flipping through every page of the titular book at lightening speed as if we could magically ingest information just by a split-second glance, and takes it pleasurably farther. Soon the cuteness wears off, as the stuttering speed of the text and occasional images flash by like the most tantalizing of flicker films: please let us catch a glimpse, just once! 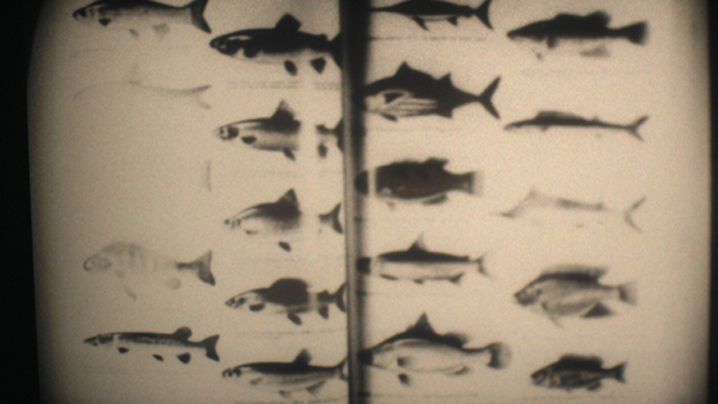 The book’s content is practically unreadable, only some of the larger images leave a trace as they speed by, and eventually the whiteness of the pages’ background blows out in over-exposure so that more and more of the film becomes flashing empty white pages with only the deep hues of the dark images retained, as if we have moved on from text, read (or absorbed) all there is to read and have moved onto still images (and guess where we would move on from there! ), finally concluding an overwhelming glare of white, the book obliterated and the source of knowledge finished.